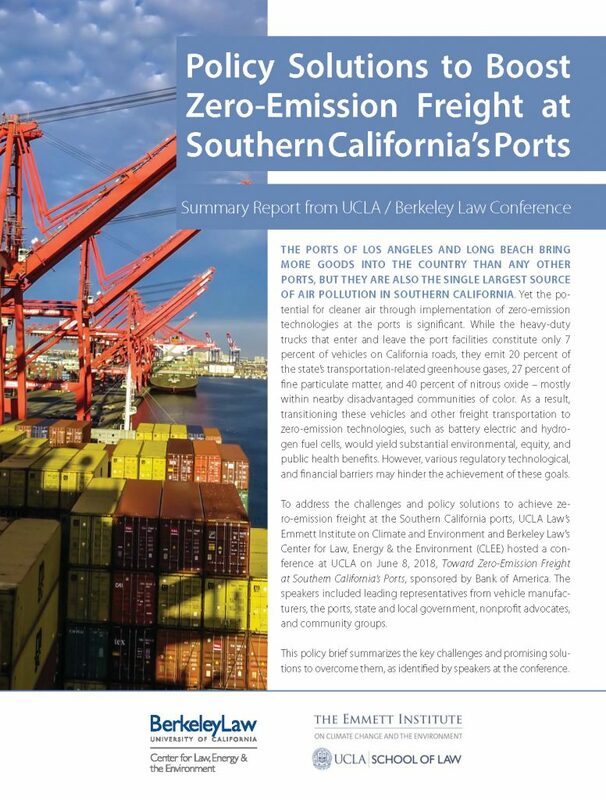 The environmental law centers at UCLA and UC Berkeley Schools of Law have released a new policy brief that describes the top challenges and solutions for deploying zero-emission freight technologies at Southern California’s ports. Policy Solutions to Boost Zero-Emission Freight at Southern California’s Ports summarizes the key findings from a conference on the topic at UCLA on June 8th. The Ports of Los Angeles and Long Beach bring more goods into the U.S. than any other port in the country. Yet together they represent the single largest source of air pollution in Southern California. While harbor commissioners have adopted an ambitious plan to transition to cleaner fuels for port-based freight in the next two decades, achieving the vision will require hard work. As the state moves toward bolstering more e-mobility options for freight, solving the air pollution problems at the ports will be a crucial step in that direction.